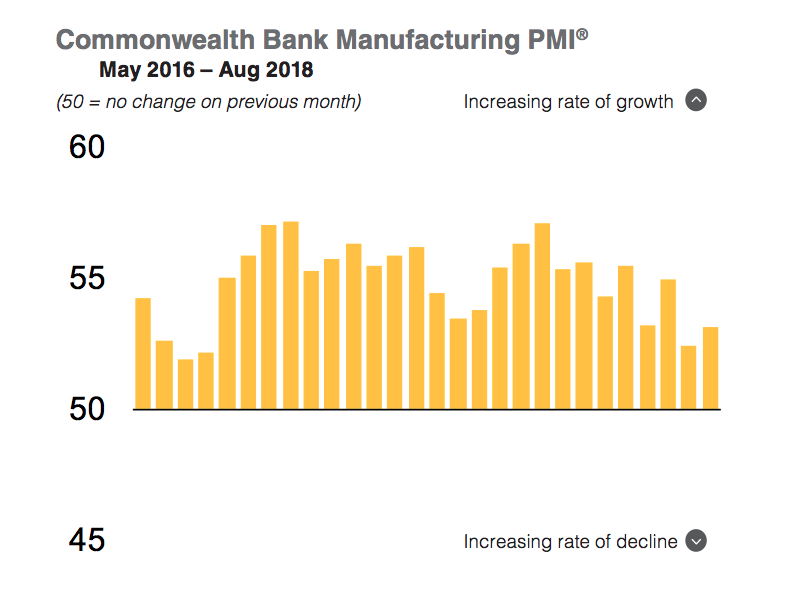 CBA’s Manufacturing Purchasing Managers’ Index (PMI) for August has shown that Australia’s good-producing economy continued to expand, albeit at a slower pace by historical standards. The CBA Manufacturing PMI rose from 52.4 in July to 53.2 in August, indicating something of a recovery from recent lows. The research has found that although growth rates for both output and new orders quickened, they were softer than their respective long-run averages. Export sales rose to a strong extent, with around one- quarter of firms reporting firmer international demand on the back of favourable exchange rate movements and greater orders from Asian markets. Employment also rose at a relatively slow pace and took its uninterrupted run of growth to twenty four months. The survey data pointed to sharp growth of purchase prices, with the weakness of the Australian dollar, as well as higher fuel, metal and food prices, mentioned by panellists. The rate of input cost inflation eased to a five-month low, but output charges were increased at the fastest pace since the survey began in May 2016.